We live in an increasingly connected world. However, long before smartphones, the internet or daily intercontinental flights, migratory birds have connected different countries and cultures. 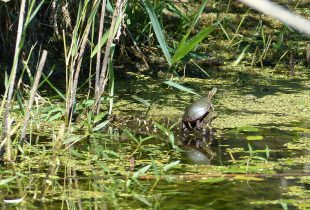 This is particularly true for species that make long journeys between wintering and breeding areas, which includes several species of waterfowl. Migratory birds physically connect these distant landscapes and they are, in turn, affected by conditions they experience throughout their range. Migratory birds also inherently connect scientists, wildlife managers, sport and subsistence hunters, and bird enthusiasts that are interested in conservation. Together, we have a joint responsibility for ensuring birds and the habitats on which they depend are properly managed for the benefit of all. The Inuit of the Inuvialuit Settlement Region (ISR) recognize that waterfowl are a shared resource and that they share responsibility for their conservation. The ISR lies along the Beaufort Sea in the northwest corner of the Central Flyway and is home to significant numbers of waterfowl during the nesting season. Waterfowl are an important part of Inuvialuit culture and the traditional northern diet. Inuvialuit have observed recent changes in the numbers, distribution, arrival dates, rates of passage and local migration routes of some waterfowl species, and the appearance of new species in their region. Inuvialuit are also concerned about the potential for local and cross-seasonal exposure of waterfowl to contaminants and disease and the effects this might have on waterfowl and human health. 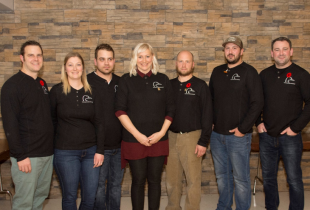 DUC was invited by the ISR Joint Secretariat and Oceans North Canada to help communities address their waterfowl conservation concerns. Our first step was to identify where locally breeding ducks and geese were coming from. We used band return data to develop a series of maps that link birds banded in the ISR to locations of subsequent recovery. Snow geese and greater-white-fronted geese were the two species with the greatest numbers of recoveries, which were reported in nearly all corners of the continent. Snow geese were also recovered in eastern Russia. 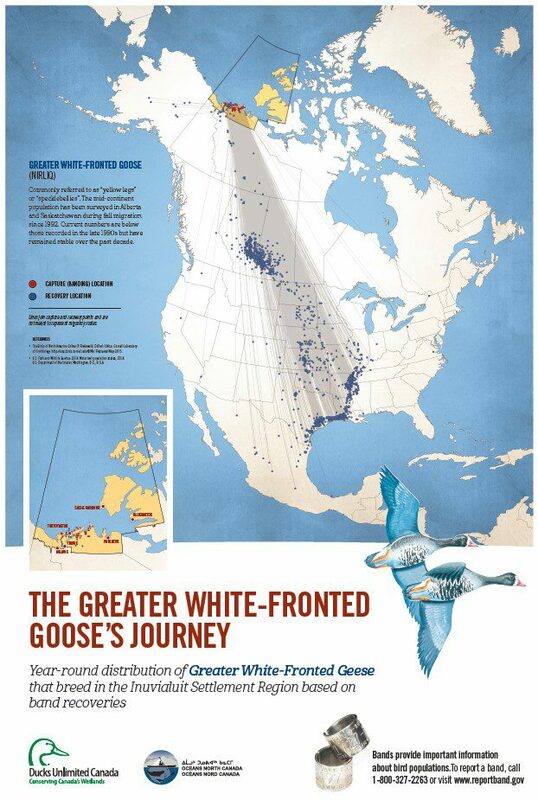 The majority of snow goose recoveries were broadly distributed across three flyways (Pacific, Central and Mississippi). Conversely, white-front recoveries were concentrated in the Central and Mississippi flyways, particularly along the northern coast of the Gulf of Mexico and the Mississippi River valley. 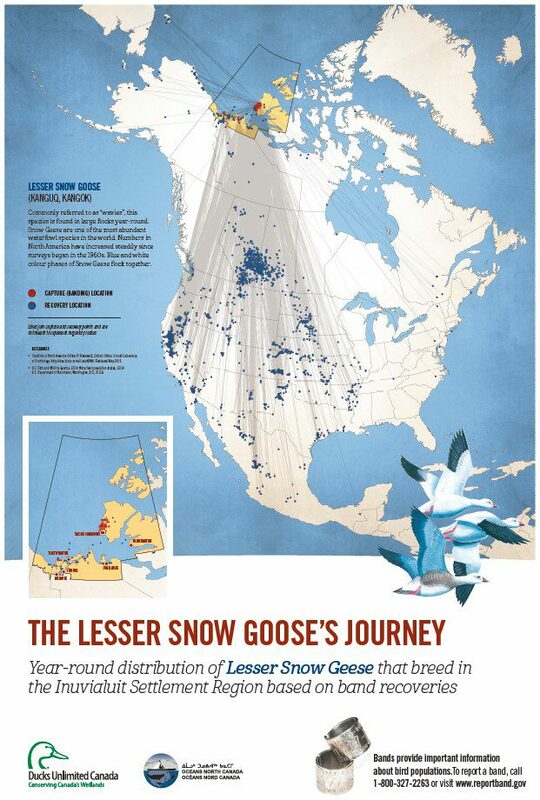 Maps have been created for greater white-fronted geese and lesser snow geese. These maps illustrate the physical connection between the ISR and non-breeding areas, and identify regions of the continent where environmental stressors such as habitat alteration, contaminants and disease outbreaks may create conservation challenges for Arctic breeding populations of waterfowl. These maps also show the challenge of managing migratory species that span several flyways and multiple political jurisdictions. 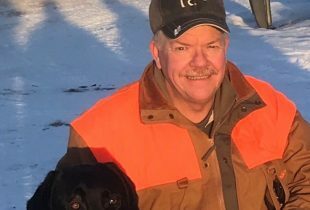 This challenge represents an opportunity for DUC to advance waterfowl conservation through partnerships with various levels of government, industry, and communities like those in the ISR. Finally, these maps demonstrate one of the many uses of band data. Climate change is occurring more rapidly in the Arctic than elsewhere and band data represent an important source of information to track the response of waterfowl populations to these changes. We encourage all hunters to continue to do their part for waterfowl conservation by reporting the bands they recover. Remember, we’re all in this together.